Welcome to the ruthless world of Vikings, where freedom, power, fear and violence reign supreme. You must lead brave warriors into battle, conquer the world and prove your might against players from all over the world. Build a magnificent palace, take part in strategic campaigns, grow your valiant army and boost your coffers by plundering loot. Usher in a new era of decisive conquests, fierce battles and heroic deeds! Do you have what it takes to be a wise and courageous Jarl? The superb graphics, compelling story and dynamic battles will have you hooked from the moment you start playing. NOTE: Vikings: War of Clans™ is completely free to play with optional in-app purchases to make your gaming experience even more exciting. If you do not wish to use this option, you can set a password in Google Play Store app menu to prevent any unwanted purchases. Be aware that you must be at least 13 years old to download and play Vikings: War of Clans™. 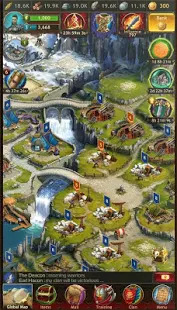 NOTE: Vikings: War of Clans™ is a mobile game that is independent of any social network or web server. We would appreciate it if you would send us your feedback and suggestions to help us improve the game and make it even more fun! Increasing the possibilities in Vikings: War of Clans! Install the update and become warriors of unparalleled might!